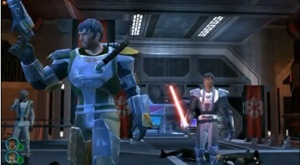 Star Wars The Old Republic: World of Warcraft Killer? You are here: Home / SWTOR / Opinion / Star Wars The Old Republic: World of Warcraft Killer? One of the most common stories you’ll see, as the anticipation builds to SWTOR launching, will revolve around one question: will it be a World of Warcraft killer? As the long-standing tall poppy, there’s plenty of people that want to see WoW knocked down a peg or two. I’m not one of them, but it’s a concept worth exploring. When SWTOR does launch, it’ll make one hell of a splash. The sort of splash that will rival or maybe exceed the launch of World of Warcraft. There’ll be all sorts of hyperbole from the gaming press and some pretty widespread mainstream media attention to. Expect TV news to show pictures of fans in Star Wars regalia lined up for midnight launches around the world. Expect a declaration by world leaders of an International Jedi Day, ratified by the UN. Ok, that last one may be a little far-fetched. During this period, which will last up to three months, there’ll probbly be a noticeable hit on WoW. Just from discussions within my WoW guild, there’s a whole bunch of people who are going to want to spend some serious time in SWTOR, and most of that time will come at the expense of WoW time. The scale of the hit on WoW will come down to how well SWTOR is targeted at age groups. My guild is primarily in the over 30’s age group and there’s a lot of excitement. For the younger groups, the perceived quality of gameplay and graphic will play a bigger role in determining a shift in games. Once the hype dies down, the real test comes when assessments are made on growth in players. This, like any MMOG, will rely heavily on playability, variety of content, how easy it is to socialise in-game and the ease with which one can get immersed in the lore. On the face of it, Star Wars has an incredibly rich story that LucasArts have taken some pains to maintain control over. It’ll be the combining that with an intuitive, outright fun game that’ll determine the ongoing success of SWTOR. Of course, saying a game needs to be playable is about as innovative as a social marketer on Twitter, but there you go. A final factor will be how emphatically SWTOR is adopted in countries like South Korea and China. Both have large and avid gaming populations and it will be their propensity to switch that could be key. I expect Starcraft 2 to play a large spoiler role in the equation worldwide as well. Here’s where I get down to pure conjecture and the primary reason I believe SWTOR isn’t a WoW killer. The vast majority of players in the longer term aren’t going to jump to SWTOR at the expense of WoW. Those that can afford it will pay to access both on an ongoing basis, assuming SWTOR‘s pricing model is competitive. SWTOR will grow to close to WoW‘s size in a much quicker timeframe than WoW did. It may even exceed WoW‘s subscriber numbers eventually, but neither will establish an overwhelming dominance in the forseeable future. Blizzard Entertainment have five years of MMOG experience under their belt to throw new innovations and gameplay aspects at SWTOR, while BioWare undertake the huge task of establishing its own space. The MMOG market is so large and players so discerning, that polarising the debate by stating one option will kill another is silly. The reality is that unless BioWare make some large mistakes, Star Wars through its enormous userbase will ensure that WoW has its biggest challenge on its hands, but one it’s more than capable of meeting. It’s quite possible to have two MMOG giants in residence, particularly given that the MMOG house has grown so much over recent years. My opinion aside, I’d love to hear your thoughts. I’ve created a poll which you’ll see on the right hand side of our web page. Or feel free to make a comment with some more detailed thoughts.